If exam stress and late deadlines rarely ruffled your feathers at university, the ability to keep your cool in tricky situations could be a skill put to use... on sketchy alpine roads! It pays to be a ‘professional’ driver as the role certainly offers many perks. As such, we’ll run you through the highs - and lows - of season life behind the wheel. If you’re a confident cruiser, a driving job is a pretty sweet deal. The round trip to the airport and back will take the whole day, but whilst driving to pick up guests, you can listen to the radio, take in the countryside and nip into civilisation for a lush lunch - which certainly beats cleaning bogs. During the week you should have plenty of free time for the slopes. Expect the weekends to be a write off since transfers days are Saturdays and Sundays, but other days allow scope for slope time. If you’re dropping clients from the chalet to the lifts in the morning, once you’ve deposited your cargo, you can typically ride until you’ll need to pick the guests up again in the afternoon. If you spend five months in the mountains with no chance of escaping the resort, things can start to get claustrophobic. As a driver, you’ll be nipping down to the valley at least a couple of times a week. Stock up on outside news, bump into pals from other resorts and grab your chalet hosting mates a fresh toothbrush (that may cost them €8 up the mountain). If you’re able to give lifts to seasonnaire friends, your popularity levels will soar. Cabin fever is very real, and you’ve got the keys (literally) to relive it for your fellow seasonal workers. Picture this: the snow is coming down heavy, the lights are twinkling in the resort, and you’ve just passed over the last suitcase to a beaming guest. Great snow conditions and a speedy transfer can loosen many wallets. Tips are a great benefit that to bear in mind when driving. The downsides don't often happen, but when they do they can make your trips to and from the resort a tedious trek. If a flight has been cancelled or delayed by four hours, this will directly affect you. You’ll be the one watching the clock on a hard plastic airport seat. Prepare to be very flexible and able to find a cheap coffee at Geneva airport - a feat as rare as spotting the elusive mountain yeti. Snow tires will become your best friend as you’ll need to navigate icy terrain and sudden snowfall. 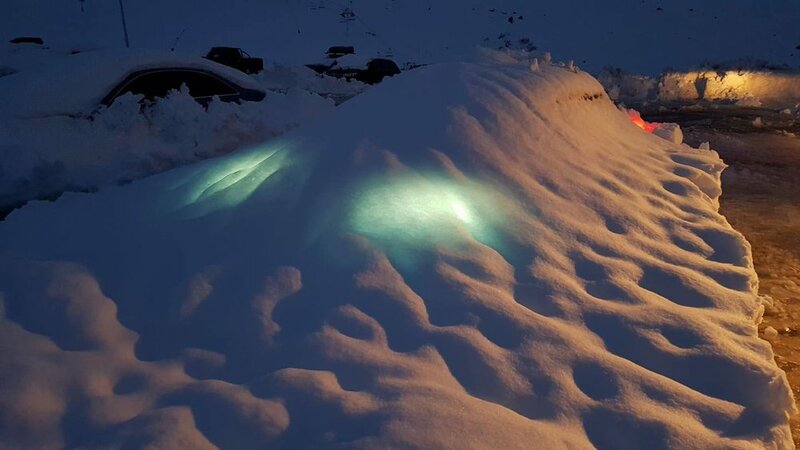 You may have to dig your way out of a blizzard blocked road, and be potentially stuck for hours in a traffic jam seemingly as long as the Great Wall of China. You'll learn that packing your entire ski wardobe and plenty of food is the best survival plan. You’re the first person guests spot at the airport so prepare for a plethora of questions. Core queries revolve around the time it takes to get to the resort, the previous snow conditions and what your plans are for the upcoming summer. Of course, these are exceedingly well meaning, but it’ll be hard to contain a sigh when answering these in a constant loop, week after week. If you’re a liquor lover, this is not the right role for you. You can’t get drunk and work after a sodden apres session. Even if you contain it for the big nights, it’s dangerous to drive guests to the lifts hours later and even more so when you’ve got a long day of transfers down a steep, winding road. Steer clear of the booze and get stuck into the powder days instead. If you’re confident driving in poor weather, willing to be flexible and able to make light of stressful situations, this is the role for you. Just don’t forget your snow tyres and a great sense of humour for those long, arduous, snow-riddled journeys.